Did you know that 2015 was a record year for new car sales in Canada? And if January 2016 is any indication, 2016 looks as though it’ll be another bumper (yes, pun-intended) year for new vehicle purchases. Buying a car is one of the biggest purchases you’ll make next to buying a house. And when you think about adding that big ticket item to your monthly or annual budget, there are a lot of costs you need to take into consideration to get an accurate idea of what it will cost. 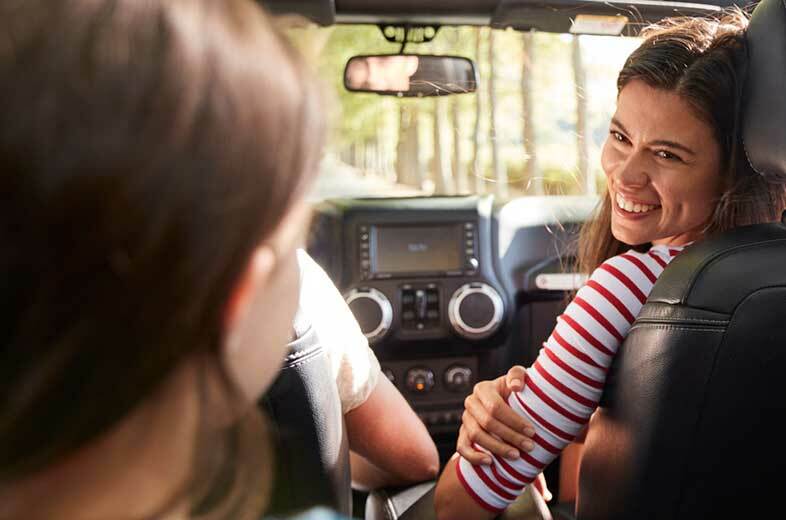 To help you make an informed and financially sound decision, we’ve put together a a guide of expenses you need to include, when figuring out the cost of buying and driving a vehicle. When calculating the cost of car ownership, divide your expenses into operating and fixed costs. 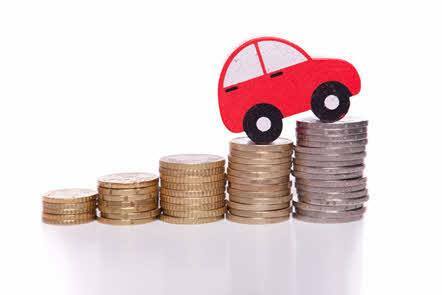 Fixed costs are cash outlays that you have to make if you own a car and don’t drive it! Operating costs are variable and change depending on your vehicle and your driving habits. This includes costs like fuel and maintenance which increase the more often you drive. Cheaper Isn’t Always Better : A cheaper-priced car does not necessarily cost you less year over year. Other important factors come into play such as fuel consumption, maintenance costs and depreciation. Drive Your Car A Long Time : The longer you own a particular car, the less it will cost you to own per year. This has a lot to do with depreciation costs. Buy A Car With Good Resale Value : Depreciation costs are the most expensive factor in your car purchase so find a car with a good resale value and you can save. Depreciation Costs Are High In Year 1 : When you drive a car off a dealership lot, you can lose between 15-20% of its value immediately. Larger Vehicles Are Expensive : Large and luxury SUVs vehicles are the most expensive to own. Pickup trucks are almost as expensive. If saving matters, think twice before you choose one of them. Save With Hybrids : Hybrids that are not luxury vehicles or SUVs can save you money if you keep it for 5 or more years. For more insights on costs when buying and owning a car, read What That Car Really Costs To Own . We’ve put together a checklist of the total costs you need to calculate to help you understand how much your car will cost to own and drive. Below this list, we’ve given you more detail for each item. Here’s what you need to consider if you want to get a clear picture of the total costs of owning and driving car. The price that you see advertised for a new car is the Manufacturers Suggested Retail Price (MSRP). But that is not usually the total cost that you pay when you buy it. Below we’ve listed some of the typical “extras” you might encounter. Freight Or Shipping : Also known as Destination and Delivery Costs (D & D for short). When you buy a car, it isn’t in a showroom and has to be shipped to you – at an additional charge. Market Adjustment : If a car is in high demand or short supply, the dealer will put a premium on the vehicle usually known as a market adjustment. ADM/ADP (Additional Dealer Markup or Additional Dealer Profit) : Dealers generate a little extra profit from this cost to you. Admin Fees or Processing Fees : This charge usually appears as a cost to you when you apply for dealer financing. Dealer Financing : The dealer acts as the liaison between you and the lender. They don’t have to give you the best rates. Negotiate with your lending institution before you go in to purchase a car. You may be able save a lot of money here. Taxes : You will have to pay federal and provincial taxes on your purchase. Remember that when you are buying a car, every line item on the pricing sheet is negotiable (except for the taxes but they’ll depend on the final agreed-upon price you pay). You’ll see some additional costs. If you don’t know what they are, ask to have them explained to you. Most people have to finance a car purchase so this becomes another cost to you. You can choose to get a car loan or you can enter into a lease agreement. Watch out for a 0% loan for a car purchase. As they say, if it’s too good to be true, it probably is! A dealer will usually give you the choice of a 0% loan or a cash rebate on the total cost of the car – you won’t get both. If you’re interested in going deeper into car loans, read this article. Car buyers are attracted to lease agreements because monthly payments are usually lower. A lease agreement is like a long-term rental – you are paying for use of the car. But once a lease agreement is terminated, you walk away from the car or you make a final payout amount to buy the vehicle – which can make your total costs higher than getting a loan. Car registration is another cost that you need to factor into your car purchase. Once you have your vehicle permit and plates, you only pay the recurring annual fee for your license plate sticker. Older cars will have to complete an emissions test. Your license plate sticker is $108 in southern Ontario and $54 in Northern Ontario. Learn more about the costs of registering your car in Ontario . Most new cars come with warranties. Check what is covered and how much you’ll save if you have a problem during the warranty period. Remember, the better your warranty, the potential lower costs of maintenance and repairs. Sometimes you can buy extended warranties when you purchase the car. This is an extra up-front cost but over time, you can save yourself on repairs and maintenance. Some cars and brands are known for quality warranties like Honda or BMW. You have to decide whether you will be better off paying up front in exchange for potential costs down the road. Do your research before you buy a warranty. They are not all created equal. Base your estimate of regular maintenance costs on the car manufacturers recommended maintenance schedule – oil changes, brakes, rotors, fluid levels, etc. Don’t forget to factor in bigger maintenance costs like some engine repairs. Speak to your dealer about yearly costs for regular maintenance for your car model. Maintenance schedules are often based on mileage, so as you put on more kilometres, you’ll need servicing more frequently. This translates into higher costs. Remember, your driving habits will also influence your maintenance costs. Are you hard on your brakes or are you an aggressive driver? You’ll put more wear and tear on your brakes and your car. 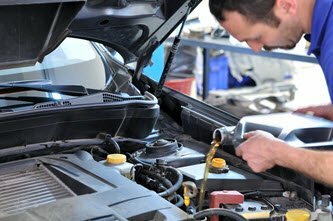 Here are some extra tips to help you lower your car maintenance costs. Think about winter tires. Do you need wheels and rims to go with the tires? You don’t have to purchase tires every season so it’s not exactly an annual cost. Still, remember to factor the cost of tires and the cost you pay to have them switched over from season to season every year. The body work we’re referring to here is not accident damage, but more wear and tear to the vehicle’s body—things like windscreen chips, paint scratches and rust repairs. These are minor repairs but over time – especially if you keep your car for several years, they may add up. The depreciation cost is the difference between what you pay for your vehicle and what you get for it when you sell it or trade it in. Some car makes and models hold their value better – which means less cost to you. Also, the more kilometres you drive annually, the greater the yearly depreciation in the value of your vehicle. Your car’s value depreciates the most during the first year of its life. Some estimates indicate that depreciation costs can account for 57% of your cost to own the car in the first year. Depreciation steadily decreases over time so by year 5, your depreciation accounts for 48% of its cost and by year 8 – only 43% of your costs are depreciation. A couple of online sources state that you can lose from 10-15% on the value of your car when you leave the lot. That can add up to a lot cash in a short period of time. This infographic shows the TMV (True Market Value) of a vehicle (at the time of purchase is $29,873. Then 1 minute after purchase, the TMV is $27,314 or 91% of its value on the lost – 60 seconds prior. That’s 9%. A new car loses 11% of its value when it leaves the lot. For each year of the first 5 years, a car depreciates 15-25% per year. After 5 years, a car is worth 37% of what you originally paid. The cost of depreciation accounts for nearly 60% of a cars costs in the first year of ownership. Over time though, depreciation rates decrease and your cost of ownership decrease with it. Depreciation is a real but somewhat hidden cost of car ownership. If you haven’t kept records about kilometres driven and what you’ve spent on gas, you can always estimate by using the averages car companies publish or figures you can get from the Ministry of Transport. For example, a 2016 Mazda5 averages 10.8 city L/100 km and 8.3 highway L/100 km and a combined L/100 km of 9.7 (From the Ministry of Transport ). 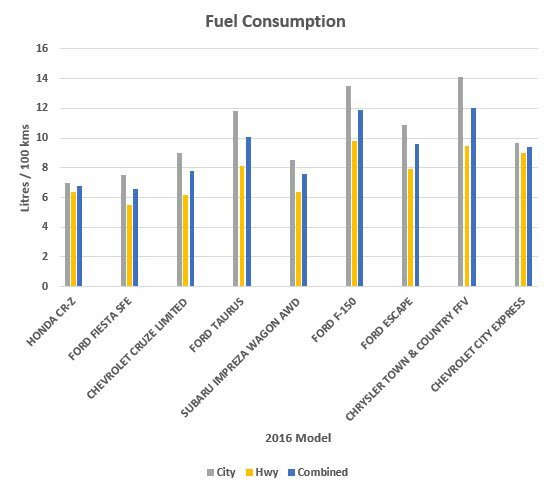 We did a little research on fuel consumption ratings and yearly costs using the Ministry of Transport’s Fuel Consumption Ratings Search Tool. 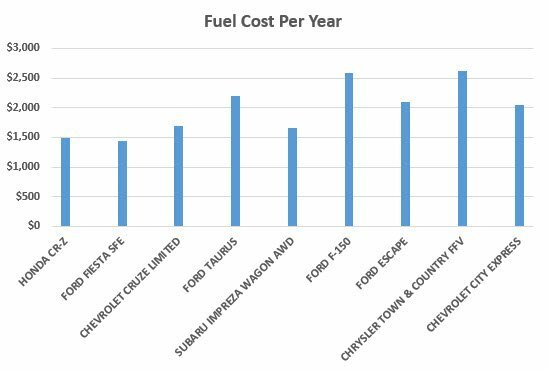 We put together some charts to help illustrate fuel efficiency and consuption costs for cars from various class. Notice that yearly fuel consumption costs range between $1482 for a Honda CR-Z which is a sub-compact car and $2594 for a Ford F-150 which is a standard pickup truck. In general larger vehicles consume more fuel as they are heavier and have larger engines. Remember that fuel prices fluctuate, sometimes widely, so this can change your annual costs for owning a car. Go try the MTO Fuel Consumption Tool before you buy your next car to get an idea of what your annual fuel costs could be. Car insurance rates are based on several factors about the driver, the vehicle, and the coverage and insurance company that you select. Experience : What driver’s license do you hold – G, G1, G2? How long have you been insured : the longer your insurance history, the better rates you’ll probably get. Age : as you age, you are more likely to drive more carefully. Gender : sorry men, driving studies confirm that women are less likely to be involved in accidents. Your Driving History : At-fault accidents, tickets and insurance claims point to higher risk drivers – and that results in higher rates to you. For more info on keeping your rates down, read our Top 10 Car Insurance Savings Tips. Safety Rating : Your car’s safety rating impacts insurance costs. The collision costs and medical costs (and benefits costs) are lower when you have a safer car. Theft : How easy or difficult is it to steal your car? Your comprehensive insurance costs will be lower based on this. Repair Costs : How much will it cost to repair your car? 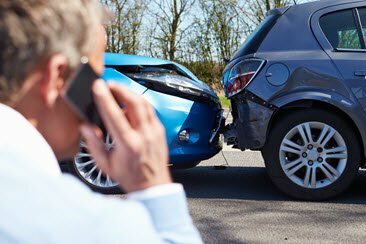 Repair costs (parts and labour) impact collision insurance. Domestic cars are generally cheaper to repair than imported cars. Find out what the cheapest cars to insure are for the last couple of years in our Cheapest Cars To Insure article. Access the IBC “How Cars Measure Up” Report here. In an effort to help car owners understand the true costs involved in car ownership, the CAA offers this handy tool to estimate total outlay on owning a car . Try it out to get an idea of what you will spend to be a car owner. Purchasing a new car is to an adult what going to the candy shop is for a kid. So many delicious options! Viewing the beautiful new models in the showroom, taking one for a test drive and shopping around is just a fun day out. But with some research and knowledge you can save yourself a lot of money on buying and driving your car. Make sure you take all the necessary time to weigh the costs, evaluate your options and choose a car that best fits your needs and budget.